We are having another homepage photo contest! We received a bunch great photos from everyone for our last photo contest, so this time let's make it even better! Submit a high quality photo. Choose a photo that is large enough to fill the homepage slideshow without looking blurry or distorted. The dimensions of our homepage slideshow are 580 x 300 pixels. 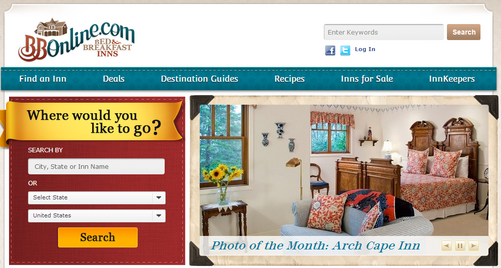 Submit a photo only of your B&B. Food photos, pet photos, greenery, and sunset photos are an excellent supplement to your listing, but we want a photo that is exclusively of your B&B. This can be an external photo, bedroom photo, dining room photo, etc. Horizontal photos are better than vertical photos. If you take a look at the homepage, you’ll notice that our slideshow is shaped like a rectangle. The photos that work best with this are ones that are horizontal so try and find a photo that is wider rather than taller. Submit your photo by August 29, 2014 to [email protected] . We will keep a special album on our Facebook page showcasing all of the entries.